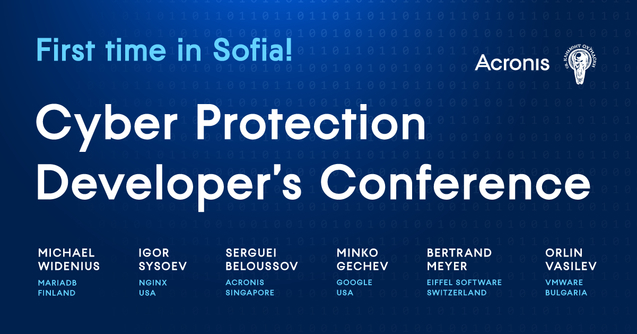 Acronis Cyber Protection Developer’s Conference will be held in Sofia on 30 January 2018. The conference will bring together world-class security experts from Google, VMware, Acronis, MariaDB, NGINX to review cyber threats and discuss best practices to protect data, applications, and systems. Acronis Cyber Protection Developer’s Conference is the place where technology innovators meet software developers. Don’t miss this unique opportunity to discuss the future of cyber protection, secure software development, performance improvement, and reliability of systems with the world-renowned speakers. This is a great chance to learn and ask questions. The event will be held on Wednesday, the 30th of January 2019 in Sofia University, Sofia, Bulgaria. To register, please visit https://acronis.events/sofia2019/.